The Organic Farming Scheme (OFS) is funded through the Rural Development Programme. Due to the popularity and high demand for the scheme the funding allocation of €10 million per year has now been exhausted and the scheme is currently closed to new applicants. The Organic unit within the Department of Agriculture, Food and the Marine (DAFM) operate the scheme through which prospective organic farmers enter a 5 year contract with the first two years being conversion and the subsequent 3 years a commitment to farm organically. The Organic Farming Scheme incentives farmers to switch from normal farm practice to produce organic milk, beef, and vegetables for a growing market. Organic Farming operates at the highest level of sustainability aiming to improve water quality, soil quality and preserve biodiversity. An increase in organic farming is seen as positive from a climate change and biodiversity point of view. Tom Dunne winner of the 2016 Zurich farmer of the year award which is an award to highlight innovation and dedication within the farming sector is an organic farmer. 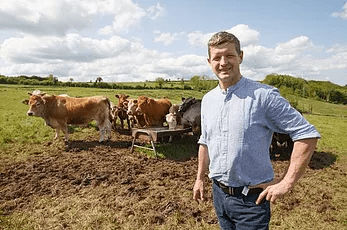 “I am beef farmer and farm 118 acres in Co. Laois. 7 years ago I was at a crossroads I wasn’t getting enough of a return from my beef enterprise. I began researching my options. I attended some organic farm walks and spoke to other organic farmers. The Organic Farming Scheme seemed like a suitable option for me. The payment of €220/ha during the two year conversion period was attractive. Following the conversion period the payment reduces to €170/ha. Organic beef commands a premium price. I decided to enter into the Organic Farming scheme. I haven’t regretted my decision once in my 7 years of participation in the scheme. Click here for more information on the Organic Farming Scheme.